More than 65,000 undocumented immigrant students graduate from high schools throughout the United States each year. These young people had no role in the decision to come to this country. Most were brought as young children by their parents or relatives. For many, this is the only country they have ever known. And yet, because of our broken immigration laws, they are doomed to a life in the underground economy unless there is a change in federal law that would provide them with a path to citizenship. The Federal Dream Act would provide undocumented immigrant students who came to this country as children with an opportunity to earn their legal status through attending college or serving in the U.S. military. Both President Obama and Vice-President Biden were co-sponsors of the Dream Act when they were in the U.S. Senate. President Obama has pledged to sign the Dream Act if Congress acts. But in spite of bipartisan support, the bill has repeatedly been blocked by a minority of senators. These young people deserve better. The thousands of undocumented immigrant students who are currently in college have done exactly what our society has asked them to do. They have worked hard, studied hard, and are pursuing a college education. They desperately want to pursue careers that would help to revitalize the economy, and to utilize their skills and education to the betterment of our society. Our undocumented immigrant students represent some of the best and brightest of their generation. In spite of tremendous obstacles, many are working two and three jobs in order to support themselves through college. They are obtaining educational training to become teachers, social workers, engineers, scientists, lawyers, and health care professionals. These are professions our society urgently needs. U.S. employers are aggressively recruiting thousands of workers from other countries to fill jobs in teaching, science, and health care, when we have a wealth of resources right here in our own country that are being ignored. The Dream Act is good public policy. Not only would immigrant students benefit, but our society as a whole would benefit from a better educated and better skilled work force. 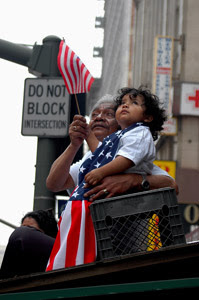 I would encourage you to call upon members of Congress to pass the Dream Act in 2010.